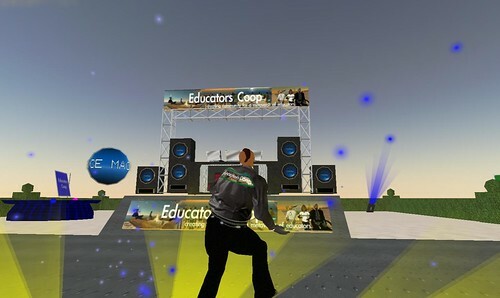 Our Educators Coop Residential Community in Second Life (http://www.educatorscoop.org) is filling very quickly, and applications to become a Resident on this island for educators and researchers continue to come in daily from all over the world! Probably one of the most gratifying tasks I have is to visit briefly via telephone or Skype with the applicants. Their enthusiasm and excitement are palpable. I am humbled by the creativity of their visions for Second Life, their aspirations for education and connection, and their profound sense of curiosity. The community is busy now selecting their parcels, moving or building houses, meeting their neighbors. And I’m happy to report that there is considerable collaboration and cooperation already going on with these activities! I was brainstorming with one resident, who revealed that she met her real life partner in Second Life, and we imagined the day/night in the not-so-distant future when the residents (from different parts of the world) find ourselves relaxing together up on the island’s central Waterfall Mesa to watch the beautiful setting sun or the rising moon while “swapping tales” about real life with Second Life —- where the distinctions somehow melt away. And then the local community musicians strike up an improvised tune…. I’ll post the numbers again sometime next week just to see if the numbers of registered users surges because of the articles. The story that isn’t getting that much attention from SL users is the Newsweek story about HiPiHi, a virtual world developed in China. I first heard of HiPiHi in a conversation with IBM’s virtual world guru John Tolva (the man behind the Forbidden City). I found the website, downloaded the beta client and navigated through the process, which of course was only available in Chinese at the time. It is now available as an English language website and viewer. I have been displaying my real life (RL) name in Second Life (SL) for about two months now and almost every night somebody asks me to explain how I do it. It really is simple, create a group in SL. 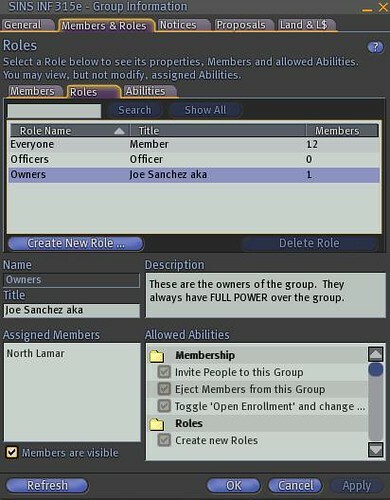 Open your group and in the roles tab select one of the roles (onwer, officer, or everyone). Lsat night we held our grand opening party for the Educators Coop. We had quite a few guests, enough to crash the sim during the first hour. For the party, we turned half of the community sandbox into a dance floor complete with DJ booth, animated speakers, dance machine, smoke machine, light effects and of course Salsa music. It was great to finally have people on our new sim, Bluewave and I were giddy to see ittle green dots on our mini map. 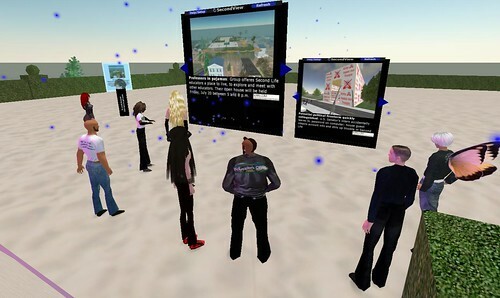 Our guests flew around to look at plots of land and then stuck around for a long time chatting away about learning and research in Second Life. This is a picture of me testing out our dance machine in front of the Dj booth. Notice my Educators Coop biker jacket? One of the things I love about SL is that you can bring your own style to the virtual world. I would never wear a freebie t-shirt from an edcuational organization in Real Life, but, i would a leather biker jacket with an Educause patch on it if they stuck a freebie in my next conference bag. Maybe this will inspire them..
Today, July 20, 2007, I gave a short presentation in Second Life at a meeting of the Nonprofit Commons, a space where many non-profits have created their presence for outreach/education spaces or “offices.” What a great group of creative folks! My brief report was about a fairly new group in SL called the Non-Profit Global Network (NPGN). I believe that the perceived boundary between Second Life and “Real Life” is largely just a habitual pattern of thinking. For non-profits, as you can easily imagine, we are talking about real people, real collaborations, and real structures all situated within a social ecology, if you will, of living and working together on Earth. One of my daily challenges is to help “melt down” for some people their initial perceptions that SL is just some game or fantasy thing. It’s as real as this conversation. The kind of SL/RL collaborative activity engaged in by these non-profits in Second Life — and in whatever future iterations “it” might take — I call Web 3.0. My analysis: It is not merely revolutionary. It is transformative. – Thanks for letting me talk a little about what’s still an emerging effort with our group, the Non-Profit Global Network (NPGN). Like many of you, it’s taking longer than anticipated! 🙂 In retrospect, the easy part (ha!) was setting up the space, although it has taken some time, and then summer happened. And we had a great booth with other non-profits at the Best Practices in Education in SL Conference (a terrific 24-hour conference that we were proud to be a part of!). These are designers working in relationship with global/local development efforts, so it’s a natural fit for many of them to begin working in SL where they can use this virtual world environment to design, build, test, and most importantly, join in co-present conversation with their partners from around the world….at a fraction of the cost. That connection with us is in the early stages, but has taken on new momentum just yesterday with a conversation with Cameron Sinclair, Architecture for Humanity. He presented at TED. Let’s start collaborating in SL. – Also important and closer to preliminary agreement is connecting our presence here with the global Development Gateway Foundation, officed in Washington D.C.. Development Gateway is one of the largest and most active on-line portals for development practitioners around the world to share and exchange their latest news, information, and best practices on an almost daily basis from around the world! They have active participants from 336 countries! http://www.developmentgateway.org/. We have been in communication with them for over 2 months, and I am presenting our SL Non-Profit Global Network to them on July 3o in Washington. – Development Gateway has 673 active blogs and online communities from around the world — so the vision here is no small thing! Critically, the fact that many of the local practitioner groups have Internet access and are online through the DevGateway portal means a significant number of them will be able to make a transition into SL with existing resources. Please let me know what you think — and Robbie, too! This afternoon I served as a panelist at the Austin Technology Council’s Sales and Marketing Strategy Session. The panel featured Eric Brunker from Sentient Services, Laura Thomas(the avatar behind Dell), and Me. The panel was light hearted yet informative. 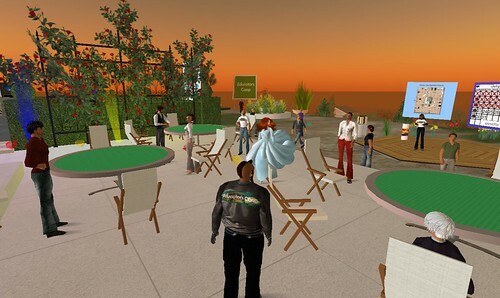 I learned that Dell is preparing to begin customer service office hours on Dell Island by August and that some marketing professionals had not yet heard of Second Life. Eric hinted at a major partnership between a virtual world newcomer and a major media corporation based in Atlanta, juicy stuff! 4. A companies virtual presence must be managed, it isn’t something to build and “let run”.